The WaveBird GameCube controller is designed and sold by Nintendo. Unlike most wireless controllers of its era, it relies on RF waves (first used in gaming with Atari's CX-42 joysticks) rather than the previously more common method of infrared line-of-sight control. The WaveBird requires a receiver to be plugged into the controller port of the GameCube. Made of the same colored plastic, this dongle features a channel-selection wheel and an LED to indicate when a signal is received. 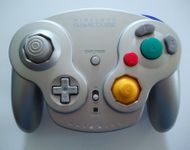 In terms of design, the WaveBird controller is built mostly in the same way as the standard GameCube controller (minus the rumble feature); the components (analog sticks, buttons, and triggers) and layout remain the same, while adding the wireless functionality and an internal battery pack. The WaveBird controller is somewhat larger and heavier than a standard GameCube controller, with the "center hole" between the D-pad and the C-stick replaced by the RF mechanism internally and an on/off switch and orange LED power indicator on the face of the controller. In terms of capabilities, the only feature the WaveBird controller lacks when compared to the standard controller is the rumble feature, the motors of which would reduce battery life. Due to the data being transmitted, relayed, then decoded, there is a very slight delay in button response compared to a wired controller, but not enough to be noticeable or affect gameplay. Source: Wikipedia, "WaveBird", available under the CC-BY-SA License.